The ease of acrylic with a twist! 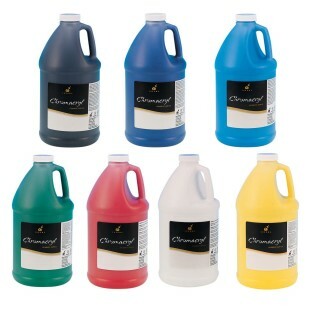 The ease of acrylic with a twist -- Chromacryl® will wash out with detergent even after it has dried. Water-resistant on paper, canvas, wood and more. Multi-purpose, non-toxic paint with intermixable colors. Compatible with all acrylic mediums. Non-toxic, won't chalk, flake, peel or separate. Yellow oxide, red oxide and warm blue are not available in gallons. paint the streets in boring locations w/this stuff! This is a decent classroom paint for the cost. I do feel a lot is wasted in the container because it is hard to get out. I cut the container in half and scrape out a could cup to a cup and a half of paint that would be wasted if I did not do that. We have been using these paints here at our art school for years! They are applied easily blend well to create new colors and are used in painting crafts such as papier mache clay and wood. Easily washed off at clean-up time. Highly recommend Chromacryl brand and SS prices for it. Gallon sizing also a plus in getting best values! Great Paint! Easy to use dries quickly! This paint is fantastic Acrylic paint can be very expensive SS provides value at an amount that will last an entire summer. With painting projects children need fast results and they want to take them home the same day. We can move through different colors in about 15 minuets each thats how fast it dries. Theses paints make painting easy and fast and cheep and clean up is a snap! We use these paints in a vast variety of projects from fine art thru decorating craft projects. It his high quality for student grade work with decent coverage. My only wish is that there were more colors such as magenta and brown availabe in the gallon size which is very economical and easy to use .